William Whitaker (1547-1595) was an Oxford-trained theologian of significant influence and prestige.1 One of his most important treatises was Disputations on Holy Scripture (hereafter Disputations), a work that set out to explain and defend the principle of Sola Scriptura over and against the arguments of Rome's foremost apologists. Whitaker's Disputations served not only to influence the formulation of the Westminster Confession of Faith, but continues, due in part to the unchanging nature of the debate, to be an important text in the modern controversies between Catholics and Protestants. This series will outline some of the major arguments Whitaker tackled in Disputations, with particular attention paid to those relevant to the present day. This "singular learning and ingenuity" shines forth throughout the text. Whitaker has incisive analytical skills; his application of razor-sharp logic is demonstrated both in his ability to properly represent his opponents' arguments and in his ability to refute them. He also employs sound reasoning in selecting the strongest forms of his opponents' arguments to refute, having no interest in refuting weak versions and claiming an empty rhetorical victory. If you would like to read and search it for yourself, the full English translation of Disputations can be found here. I've also been informed by John Bugay that Green Baggins will soon discuss and analyze the content of Disputations. 1. A very short biography of Whitaker can be found in the preface to his Disputations. 2. David Coffin, Jr., "The Teaching of the Westminster Confession on the Cessation of Special Revelation," http://www.newhopefairfax.org/files/coffinconfessiononcessation.pdf (accessed May 19, 2010). In his footnotes, Coffin cites a chapter from To Glorify and Enjoy God. A Commemoration of the 350th Anniversary of the Westminster Assembly (Edinburgh: Banner of Truth, 1994). I had hoped to verify the citation before this post, but I was unable. However, the dust jacket of my version of Disputations asserts the same relationship between chapter one of the WCF and Whitaker's work. 3. William Fitzgerald, introduction to Disputations on Holy Scripture, by William Whitaker (Cambridge: Parker Society, 1894; reprint, Orlando: Soli Deo Gloria Publications, 2005), x. 4. Ibid., iii-vi. For the sake of brevity, this list is not given in exact form. Neither is it strictly in the same order. Looking forward to this, both here and at Greenbaggins. 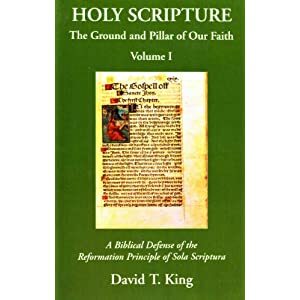 Ever since I've known him, Pastor David King has been recommending this work as one of the best resources ever on Scripture. I'm really looking forward to this as well. This is a great post. I've noticed an increase in the quality of BA posts lately. After reading through a bit of this book, I would say Whitaker makes some of the best apologetics arguments regarding Sola Scriptura I've seen, yet he is still very deficient. For example, I tracked down what appears to be his main focus on 2 Timothy 3:16f where he discusses 'pasa graphe' ("all Scripture"), it's on page 633. However, Whitaker merely assumes what he's trying to prove (and he does so throughout much of the other pages I read). If 'pasa graphe' (all scripture) actually means "every individual book or passage of Scripture", then Whitaker's argument is sunk. Assuming and proving are two different things. In all honesty, Whitaker should have known/realized that "pasa graphe" can quite easily mean "every individual book or passage of Scripture" (especially given graphe is singular in Greek here, not plural), and modern Protestant scholars rightly affirm this (for example, Kittel's TDNT Vol 1, P130, B.3, plainly says 'graphe' in 2 Tim 3:16 can very well mean 'individual books or individual passages'). I eagerly await the next few posts in this series on BA; I just hope the arguments are solid and present evidence in favor of the Protestant side, as opposed to assumptions and 'negative proof'. Nick, you figured all that out in 30 minutes? I never heard of Whitaker before, so I'm very interested in this series as well. Not all in 30 min. I wrote a blog article about pasa graphe in 2 Tim 3:16 and have spent a number of days discussing it. I know specifics of what I'm looking for, so it only took about 30 mins to look into it. I did a search for "all Scripture" on the google book link and it took me to page 633, where Whitaker seems to address the issue as fully as he's going to. Nick: For example, I tracked down what appears to be his main focus on 2 Timothy 3:16f where he discusses 'pasa graphe' ("all Scripture"), it's on page 633. However, Whitaker merely assumes what he's trying to prove (and he does so throughout much of the other pages I read). If 'pasa graphe' (all scripture) actually means "every individual book or passage of Scripture", then Whitaker's argument is sunk. Nick: I don't doubt that Whitaker addressed every single argument that Bellarmine threw at him. I'm guessing that what happened here is that Bellarmine was not as clever as you, and hadn't yet come up with the "canon" issue. Maybe he had some reservations about it, or all of his other arguments having been soundly refuted by Whitaker, he simply just left it for someone later to come up with the "all Scripture" argument. In truth, Scripture is Scripture whether or not any man or church council says it's Scripture. Do you wish to deny this? God is not dependent on you or "the Church" or anyone for His Word to be His Word. Second, Jesus was well aware of what "all Scripture" was when he cited "all the Scriptures," "beginning with Moses and all the Prophets (Luke 24:25ff.) He knew what the limits were of the Law, the Prophets, and the Writings. The earliest church knew of the extent of these Scriptures. Third, there is very little question that the Gospels and Paul's letters were collected very early on. Peter refers to Paul's writings as "Scriptures". Did Pope Peter perhaps have some "infallible" word that he failed to pass along? Your mockery here just simply shows you to be what you really are. I'm thinking back to the time when you had come up with an apologetic argument that nobody else had thought of. It was going to force even James White (may his name be blessed) convert to Catholicism! "It was going to force even James White (may his name be blessed) convert to Catholicism!" That would be like the Pope converting to Geneva Calvinism as either a Reform Presbyterian or a Reform Baptist. You obviously know about Francis Beckwith's conversion back to Catholicism. You obviously know that there's been Roman Catholic priests and nuns who've converted to Protestantism. Truth -- I couldn't say. "What's the highest ranking RC clergy in history (and in recent times, say the last 100 years) to ever convert to Protestantism? Has an RC bishop ever done so?" You will hardly find a Catholic priest in good standing converting to Protestantism. The same goes for Catholic seminarians. What you will most likely find are priests who run into moral problems or face other disciplinary issues and having no other employable skills, decide, as a last resort, to jump to Protestantism where they are held as "deities" (instant celebrities). The challenge is to find a Catholic priest with no prior history of run-ins with the Church (often unknown to the public) who announces from the pulpit that he is living the priesthood/Church for Protestantism. St Bellarmine came up with the 'all scripture' argument, Whitaker merely sidestepped it. The point isn't whether "Scripture is Scripture," for nobody denies this. The issue is what 2 Tim 3:16f is saying. If it is saying "every individual book of Scripture is sufficient" that is very different from "All Scripture as a whole is sufficient." As for my post on James White, I responded in full, noting some serious problems he opened himself up to. and For example, I tracked down what appears to be his main focus on 2 Timothy 3:16f where he discusses 'pasa graphe' ("all Scripture"), it's on page 633. However, Whitaker merely assumes what he's trying to prove (and he does so throughout much of the other pages I read). Then you pretty much missed the part where he spends the better part analyzing the statement that "All" in this place is equivalent to "the whole", and is "frequently so used… He then goes on to cite seven different scriptures where the word "all" means "the whole body of scripture. For Paul says above that Timothy was skilled in the scriptures from a boy. Now it was not in only some one part of scripture or in some single book that he was conversant, but in the whole of scripture." All of this from page 633, where you say that "Whitaker merely assumes what he's trying to prove." This is a ridiculous claim on your part. He states each of Bellarmine's objections, and he responds to them point by point. If 'pasa graphe' (all scripture) actually means "every individual book or passage of Scripture", then Whitaker's argument is sunk. … Kittel's TDNT Vol 1, P130, B.3, plainly says 'graphe' in 2 Tim 3:16 can very well mean 'individual books or individual passages' … The issue is what 2 Tim 3:16f is saying. If it is saying "every individual book of Scripture is sufficient" that is very different from "All Scripture as a whole is sufficient." Bellarmine's statement that "every part of scripture then, and each several book, must be perfect." Your appeal to Kittel shows that you don't have any idea what you are talking about. "The ground gained in the discourse is specifically related to the use and usefulness of Scripture. As Paul has confronted obstinate challenges to or outright denials of his authority by means of applications of the OT texts, so too must Timothy [confront challenges to or denials of his authority by means of applications of the OT texts]. God has ensured that the OT, text by text, has the authority and the power to achieve his desires; Paul's experience in this very use of the Scriptures is Timothy's resource and paradigm (3:10-14) for continuing the Pauline ministry. This again illustrates the principle of using Scripture to prove one's authority, and one's succession to authority. Me: Indeed, and armed with such a dictum, you should be very careful if you challenge someone who believes that the Wisdom of Solomon is Scripture. Me: Of course he did, but are you (or any other non-inspired, non-infallible individual)? BTW, which verse of Scripture was Jesus quoting in John 7:38? David Waltz: Me: Indeed, and armed with such a dictum, you should be very careful if you challenge someone who believes that the Wisdom of Solomon is Scripture. But if it isn't Scripture in God's view, it simply isn't. Of course he did, but are you (or any other non-inspired, non-infallible individual)? BTW, which verse of Scripture was Jesus quoting in John 7:38? Regarding John 7:38, the ESV text notes references to Proverbs 18:4, Isaiah 12:3, an Ezekiel 47:1. This works especially if Jesus has Himself in view as the new Temple. There's a good analysis of this in Carson/Beale's "Commentary on the New Testament Use of the Old Testament" pg 454. Given some of the textual questions you've asked, I'm wondering if you have any Greek Commentaries? I'd highly recommend that you look at some of the more recent crop of commentaries for answers to specific textual questions. "Before you can know what a text means, you have to know what it says." I didn't miss that part at all. What Whitaker is doing is assuming one *possible* option, when there are other equally valid options. That's the point. The term 'pasa' has a range of meaning. Further, Whitaker didn't compare apples to apples, for none of his passages were talking about Scripture itself. He never cited an example (at least on p633) where "all" meant "the whole body of Scripture". He doesn't analyze the fact "Scripture" in singular most often refers to individual Scriptures. Appealing to context is of limited benefit, for Paul uses a different Greek term for "Scripture," and it's also in the plural. I'm not sure how you can accuse me of misusing Kittel, when Kittel confirms certain points I've made. What book of Towner are you speaking of? I'd be interesting to see why 14 pages is necessary to exegete 2 Tim 3:16f. Your advice on knowing what it means requires knowing what it says is of limited value, for what it says can be understood multiple ways. That 2 Tim 3:16A is not fully clear in that it can carry many meanings is acknowledged by Protestant Scholars. This is by no means a so called "quibble," a lot is riding on 2 Tim 3:16, and the Greek nor context comes anywhere close to an advantage for your side. At most it's one possible option of many, but dogma can't be built from an assumption. Nick, it's ridiculous to think that you've been able to "sink" Whitaker's whole 600+ page book on the strength of a one-line citation from a Bible dictionary. For you (a) not only to think that, but (b) to bombastically come over here trumpeting it, really, really, really shows your immaturity and lack of wisdom. You seem like an enthusiastic guy with lots of energy. You had mentioned early on that Whitaker made "some of the best apologetics arguments regarding Sola Scriptura I've seen." Why don't you interact directly with some of them on a case by case basis, and prove to us just how "very deficient" he is. Start yet another Whitaker series. The world needs more Whitaker. I should have been more clear: I *never* said his whole book was sunk based on my argument, nor did I base my argument on one line from a Bible dictionary. I said his comments on 2 Tim 3:16 in support of SS are sunk, based on the 'pasa graphe' argument, to which Protestant Scholars readily concede some key points (e.g. the TDNT notes graphe in 2 Tim 3:16 is uncertain, but categorizes it most likely as 'individual book' or 'individual passage'). Hopefully this puts perspective on my overall comments, because you seemed to be drawing from them more than I intended. Just giving you a little of your own medicine. By the way, you mention how important 2 Tim 3:16 is to our position, and then you wonder why someone would spend 14 pages doing an exegesis of it. You should consider that there are different ways that we can characterize "Sola Scriptura" that are fully in line with our own doctrinal statement of it, without being susceptible to the "the [typical] RC objection [that] involves a level confusion: conflating the rule of faith with the special revelation it identifies." 1: The Bible alone is the Word of God. 2: The Bible is the only infallible rule of faith and practice. 3: The Bible is the sole final authority in matters of doctrine. By the way, if you want to talk about individual verses upon which "a lot is at stake," even though it's very, very difficult to determine the meaning of it, you should check out Matt 16:18-19 in some of the commentaries. That is BY FAR a slam dunk in your favor, and yet, you Roman Catholics have got far more invested in that one verse (yours is a whole system that will crash and burn if THAT one comes down), than anything that Protestants have got riding on 2 Tim 3:16. * I was saying, Towner disagrees with Whitaker in that Towner believes the extent of what Paul is calling "the Scriptures" only extends as far as the OT, but still, it is "profitable" so that "the man of God may be competent, equipped for every good work." Excellent Idea for a series! I can't imagine a more important topic in the current climate. It's too bad that so much ink has to be spilled over what is and should be obvious to every one that has been called by God, but understanding why we believe in the sufficiency of what God says should make for an edifying study in it's own right. The cavils that have already been hurled against this work and against the clearness of God's revelation in your introductory post prove that this will be a most worthy study.